The pointed wings, white body, boldly patterned upperparts, and lack of a deeply forked tail look good for a small gull of some kind. Several species of small gulls show a similar pattern to the upperparts as our quiz bird, including first year Little and Ross's, and first year Black-legged Kittiwake. Adult and immature Sabine's Gulls also show such a pattern. Little Gull can be eliminated by the absence of a contrasting blackish secondary bar. A Little Gull also wouldn't have wings that are as pointed as the wings of our quiz bird. 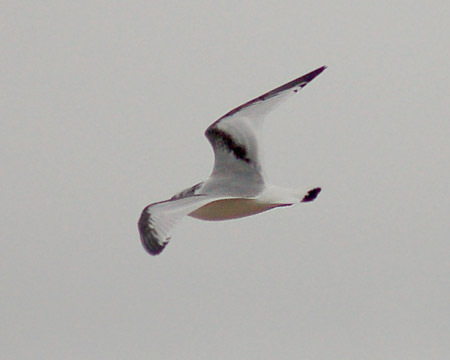 A Ross's Gull would have whiter secondaries and a pointed tail. Juvenile Sabine's Gulls have entirely brown inner wings, and adult Sabine's Gulls have an unmarked gray inner wing. Note that our quiz bird has a gray inner wing with a diagonal black bar. This pattern looks good for a first year Black-legged Kittiwake, which is what this bird is. This first year Black-legged Kittiwake was photographed by John Cassady at Miller Beach in Indiana in November, 2006.